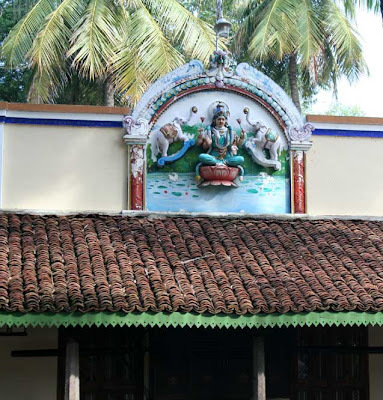 Sterling Swamimalai was our first choice when we decided to make a trip to Tanjore last December and we cherish our stay and memories till date. 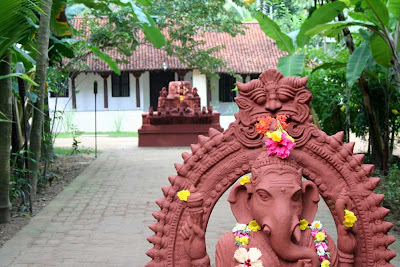 A villa built in 1896 in a traditional south indian style is the nucleus of this resort. 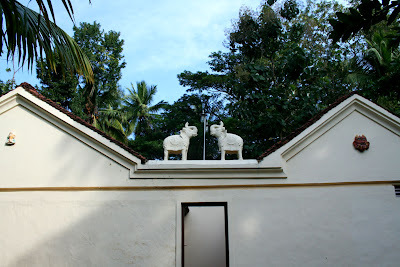 The other cottages are inspired by this main structure. 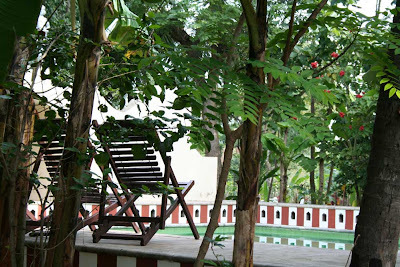 The resort is the brain child of Steve Borgia of Indeco Hotels. The minute you step into a very discreet entrance, you are transported to the 19th century. 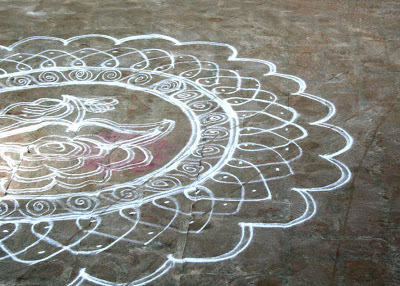 You are welcomed with temple bells ringing and a beautiful 'Kolam'- Rangoli design at the entrance. 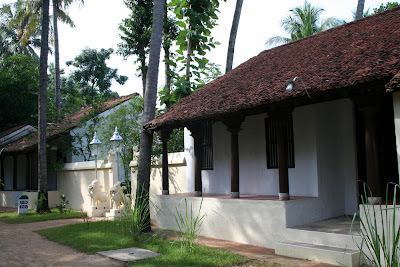 The setting is very rustic with the ambience like that of an old south indian village. 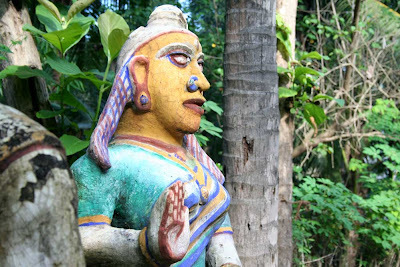 Amazing terracotta figures of Gods & Goddesses are scattered all around the resort. All courtesy the in-house potter. 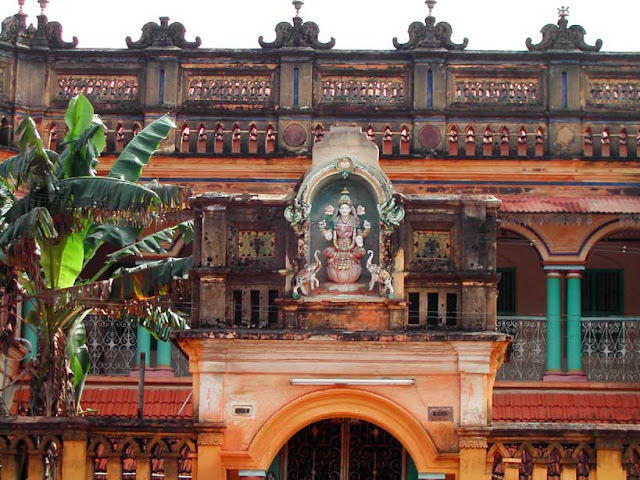 Coconut, Banana, Jackfruit, Papaya trees form the perfect setting for the village scene. 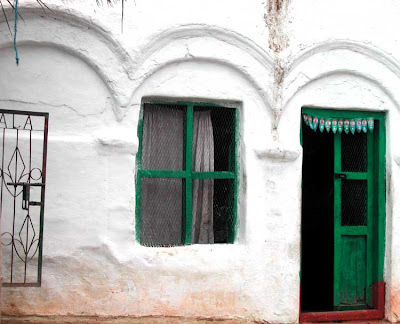 A traditional village house forms the dining area. 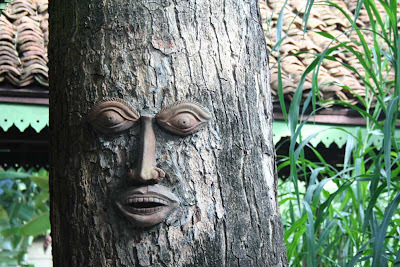 Even the trees are treated well, the potter has created lovely terracotta eyes for the trees. 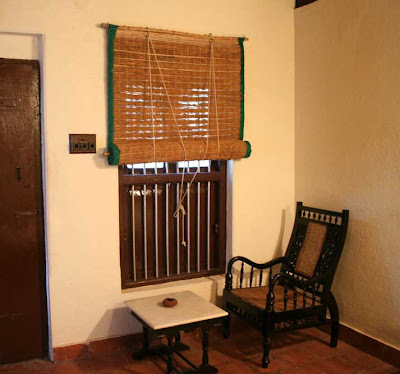 The rooms are basic with traditional furniture. The roll-up blinds are made of natural fibres for good air circulation. 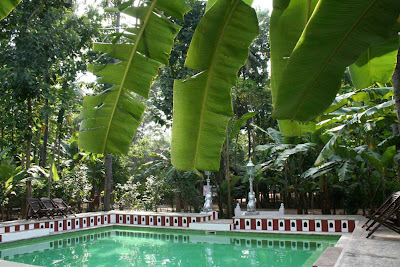 The swimming pool is designed like an old temple tank. On special occasions the side slots are lit with earthern lamps in the evening. What a gorgeous sight would that be! 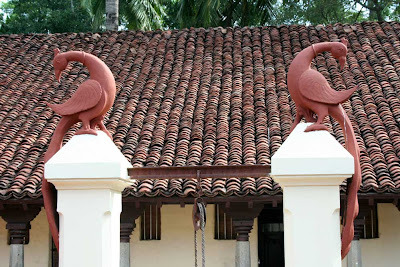 The main villa has a lovely courtyard with a natural well and a museum of antiques. 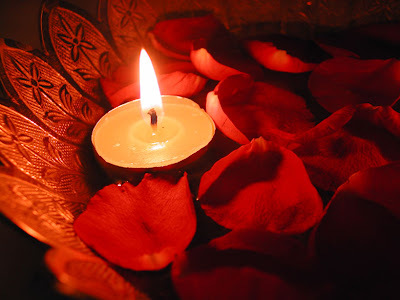 Truly traditional, truly spiritual, truly Indian. 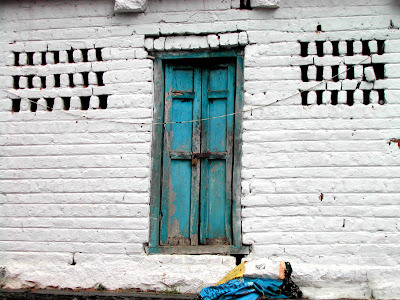 the happy living blog became an instant favourite, ever since I stumbled upon it while blog- hopping few weeks back. 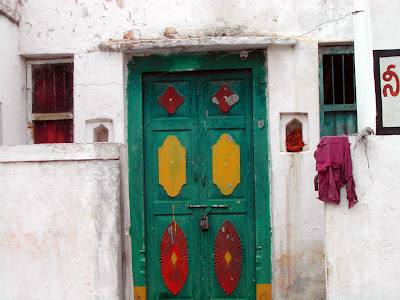 Erinn describes - 'This blog is about everything having to do with the place, experience and spirit of home and making our homes a place that we love'. 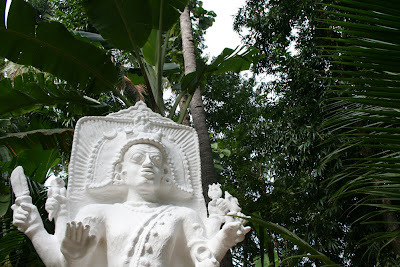 Erinn of 'the happy living blog' has been very kind in giving a great introduction to my blogs. 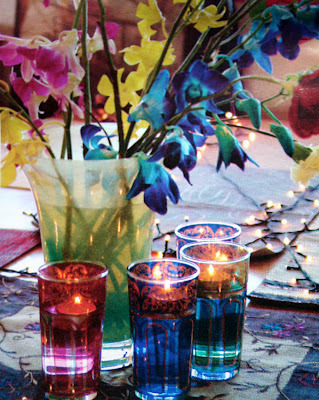 To add the sparkle to your interiors, just light few candles, diyas (earthern lamps), kerosene or hurricane lamps. 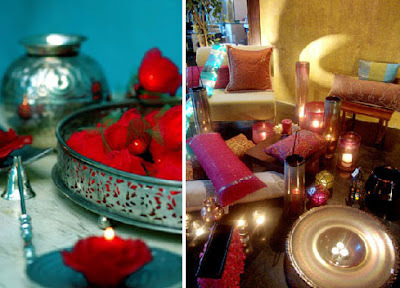 I love lighting diyas or floating candles at the entrance to the house, in balconies, on tables or just about anywhere. Here are some interesting ideas. 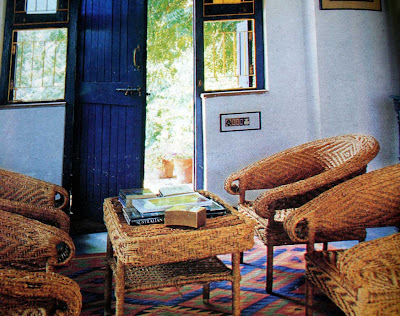 This country retreat is designed by Nimesh Patel & Parul Zaveri of Abhikram, for their friend Mallika Sarabhai a famous Indian dancer, activist & environmentalist. 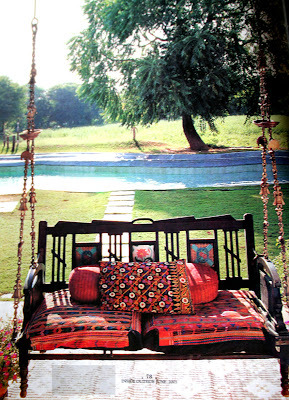 This is a traditional Gujrati Hitchkar (swing) which can be moved either way to face inwards or outwards. 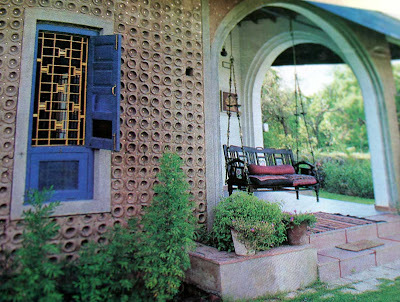 A place in a natural setting where one can rejuvenate and escape from the stressful city life. 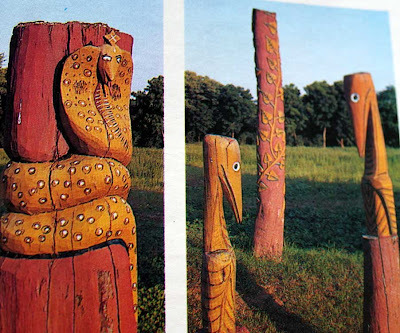 A series of wood sculptures of birds & serpents are scattered around the place. 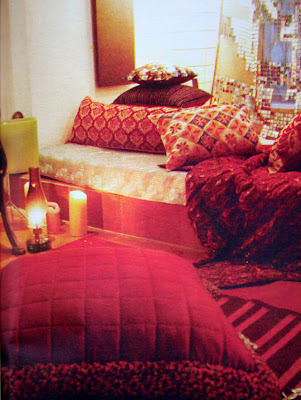 Her living space reflects her beliefs of conserving natural resources & importance of indigenous traditions. 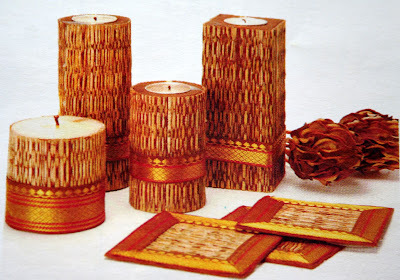 The sofas are made of natural materials like cane, jute & handloom. 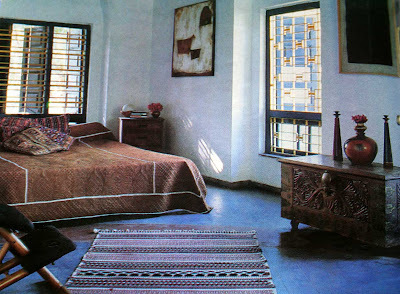 Mallika's love for traditional crafts of Kutch can be seen in the hand embroidered covers and quilted bedcovers in her rooms. 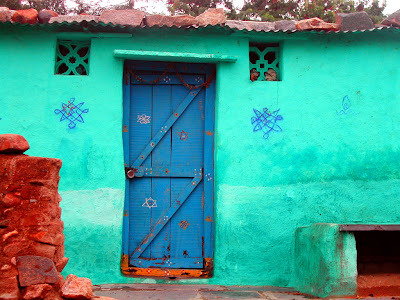 Rural India is a great inspiration for door art & vibrant colour combinations! Here are some inspirations. 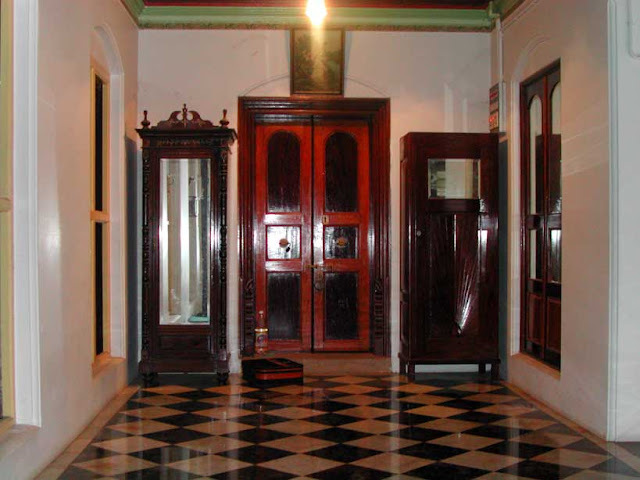 This an old chettinad door restored from a demolished mansion. 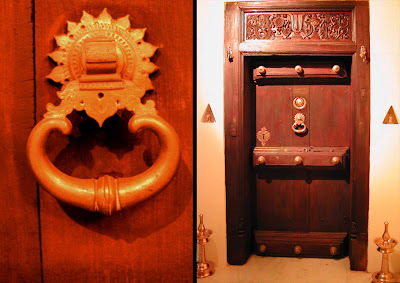 We loved the brass door knocker and intricately carved panels, we got it embedded in one of our living room walls. 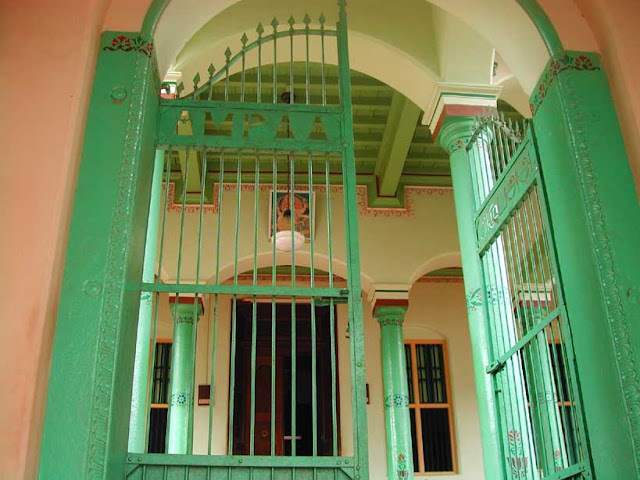 The Chettiar Mansions of Karaikudi. 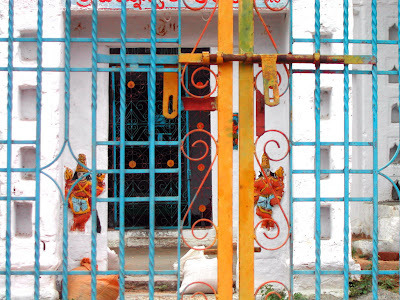 Karaikudi is a city in Tamilnadu which is known as the homeland of Nattukotai Chettiars. 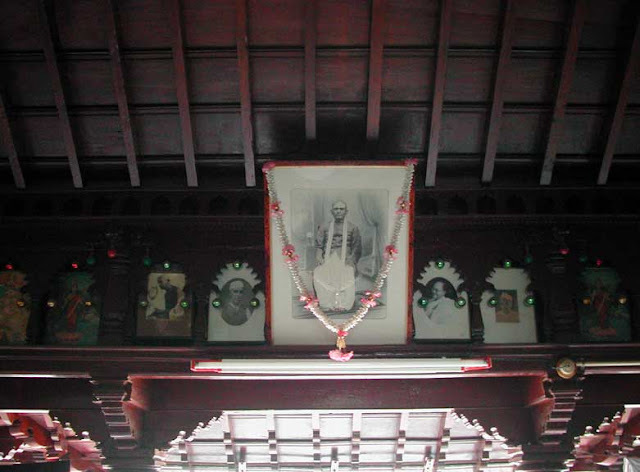 Chettiars are a prosperous banking & business community many of whom migrated to Burma, Sri Lanka, Malaysia etc . 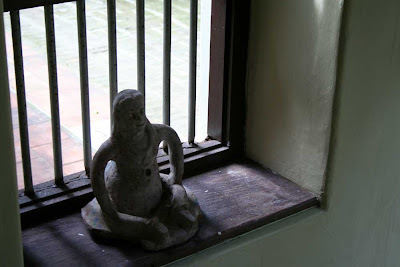 We visited a mansion of one of the Chettiars who welcomed us into their home with open arms. 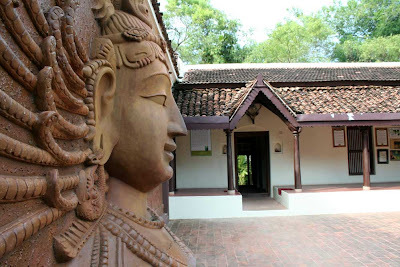 Intricate carvings on the door just took my breath away. 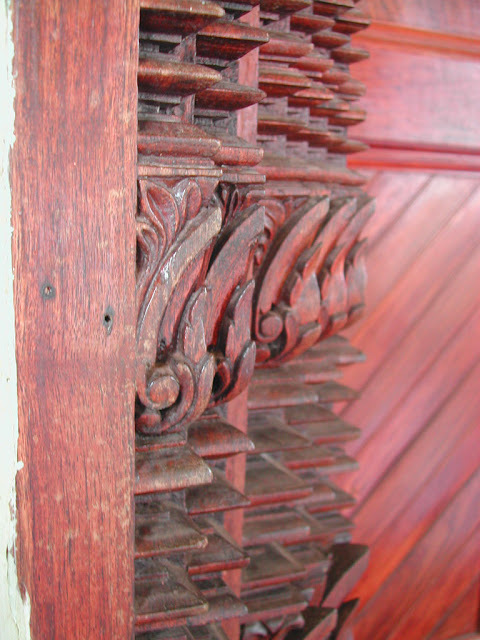 Close-up of the carvings in one of the main doors. 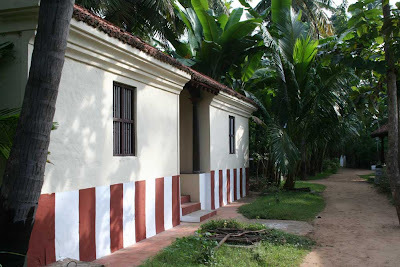 The design is typical of traditional south indian village homes...there is an open courtyard in the centre through which natural light fills the whole house. 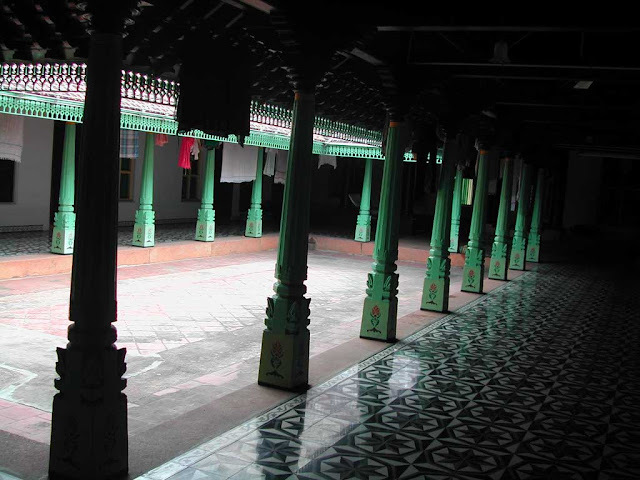 Beautiful stone-carved pillars line the courtyard. 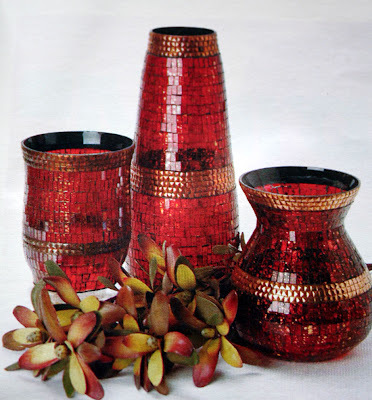 Colourful handmade floor tiles called Athungudi tiles demarcate the various sections of the house. 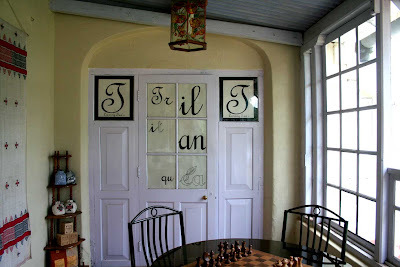 This entrance room had a chess board floor design. 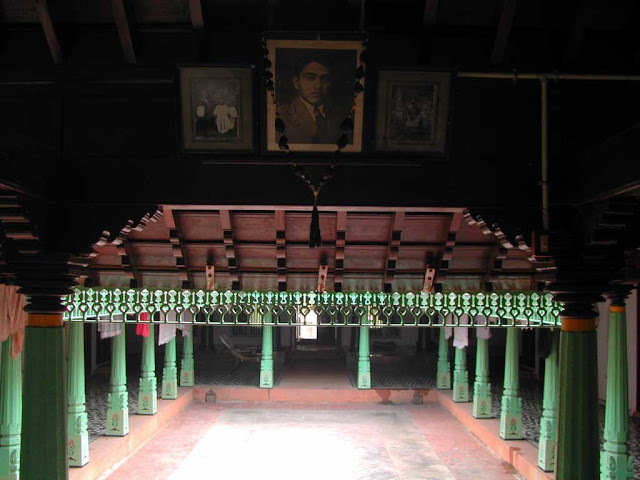 Just loved this space dedicated to the black & white pictures of their ancestors. Lovely! 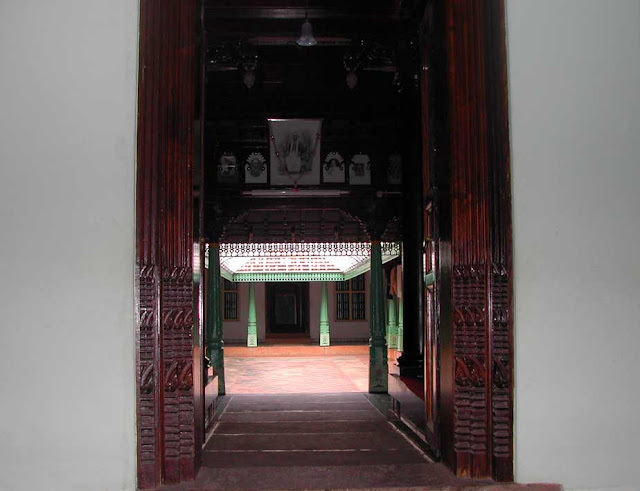 * Intricately carved doors in Burma Teak. 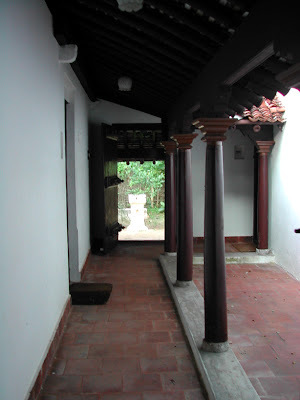 * Carved stone & wooden pillars and beams. 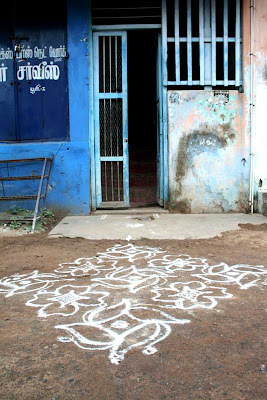 * Handmade Athungudi floor tiles. 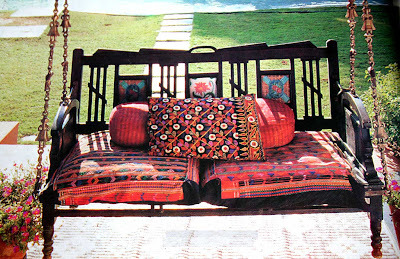 * Carved wooden furniture with antique tiles. 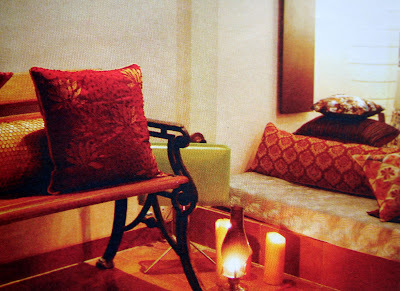 Tranquilitea - A Tea Lounge. 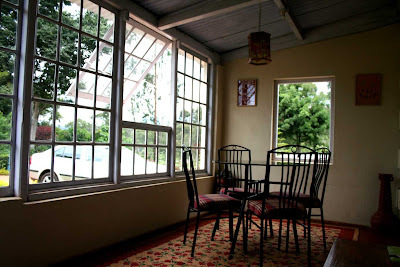 On our recent trip to Coonoor, the lovely hillstation at Tamilnadu. 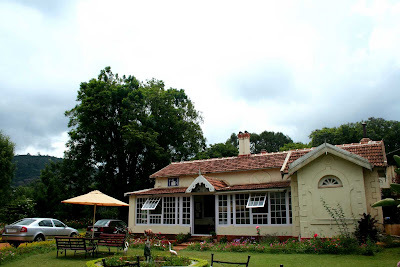 We spotted this lovely old british style bungalow with beautifully manicured lawns and colourful flowers. 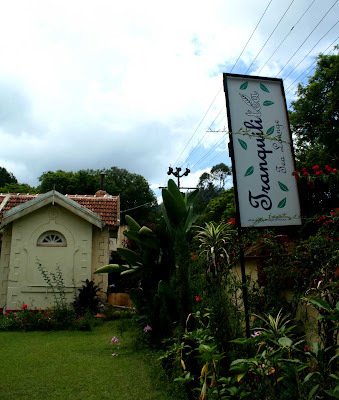 Hesitantly we drove inside and realised it was a tea lounge called Tranquilitea. Wow! Retaining the British style, with fireplace et al. 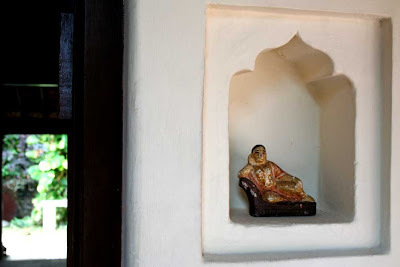 intact they had created a tranquil tea lounge where one can savour the flavours of Handmade Teas, Frost Tea and many more and be transported to the bygone days of the Raj.